The Grasshopper 524V-42 is the fastest, most economical and compact FrontMount™ riding lawn mower available. 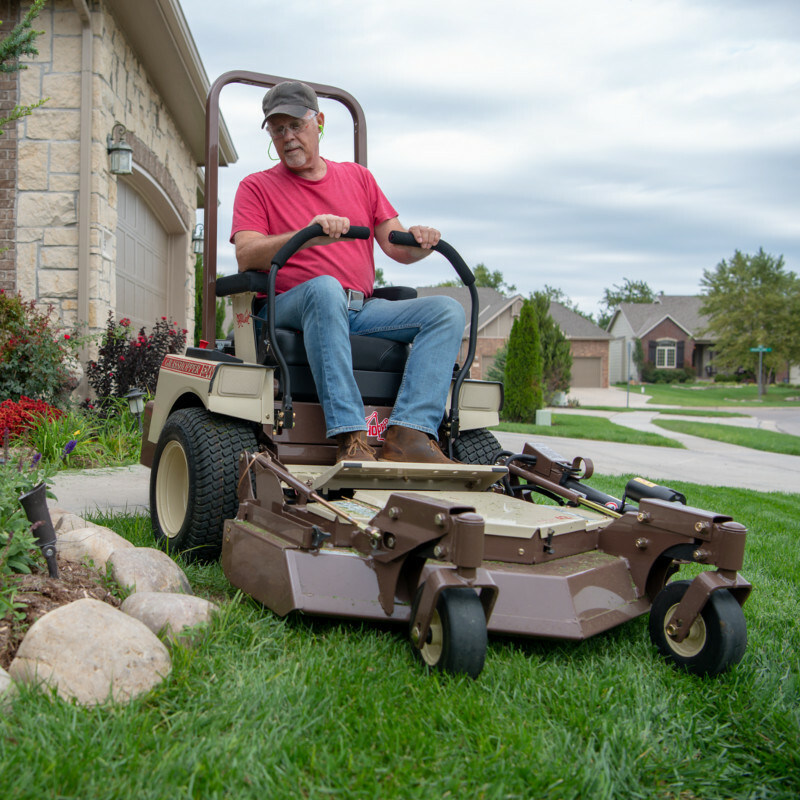 This zero-radius mower with a 42-inch front-mounted cutting deck will fit through 4-foot gates and is perfect for homeowners and landscape professionals. 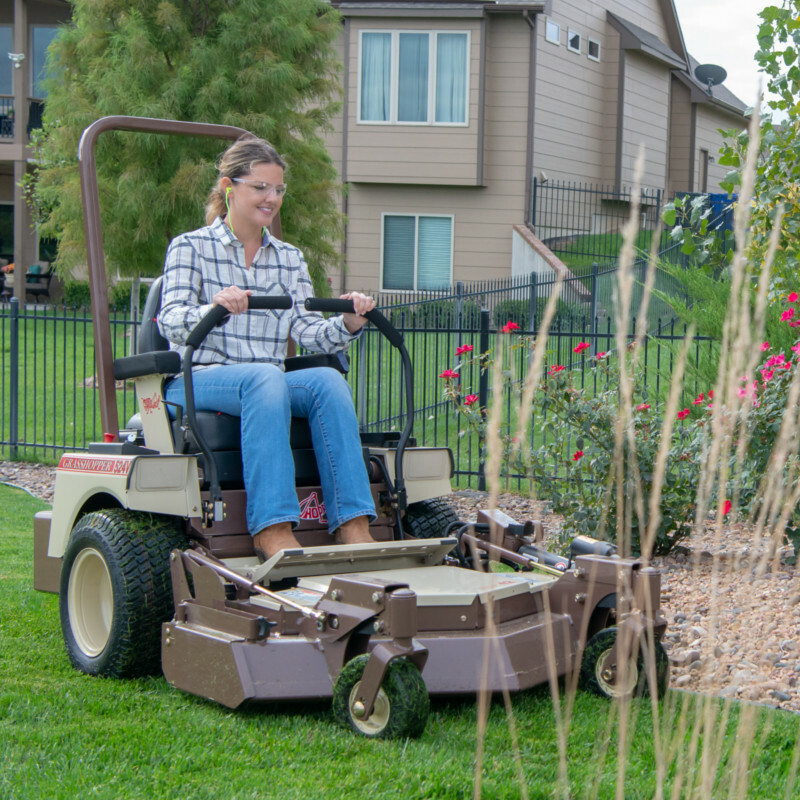 Enjoy all the zero-radius maneuverability, cut quality, comfort and durability that only Grasshopper riding lawn mowers provide. The PowerFold® Electric Deck Lift feature raises the deck to a near vertical position for easy cleaning and compact storage. 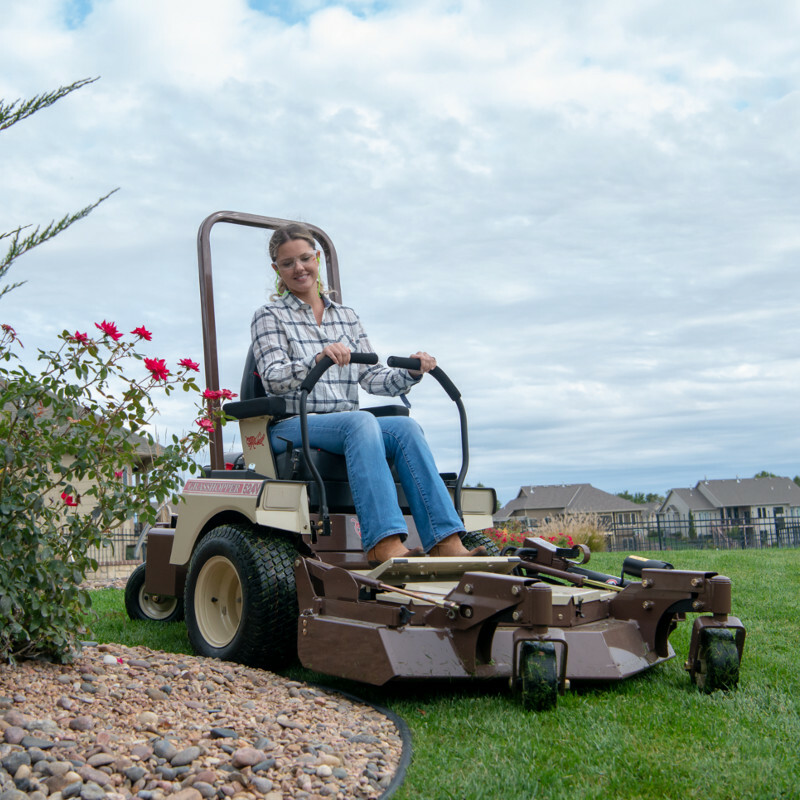 Standard on all FrontMount™ DuraMax® decks, PowerFold® is the zero-turn mower industry's first electric deck lift (introduced in 2004). 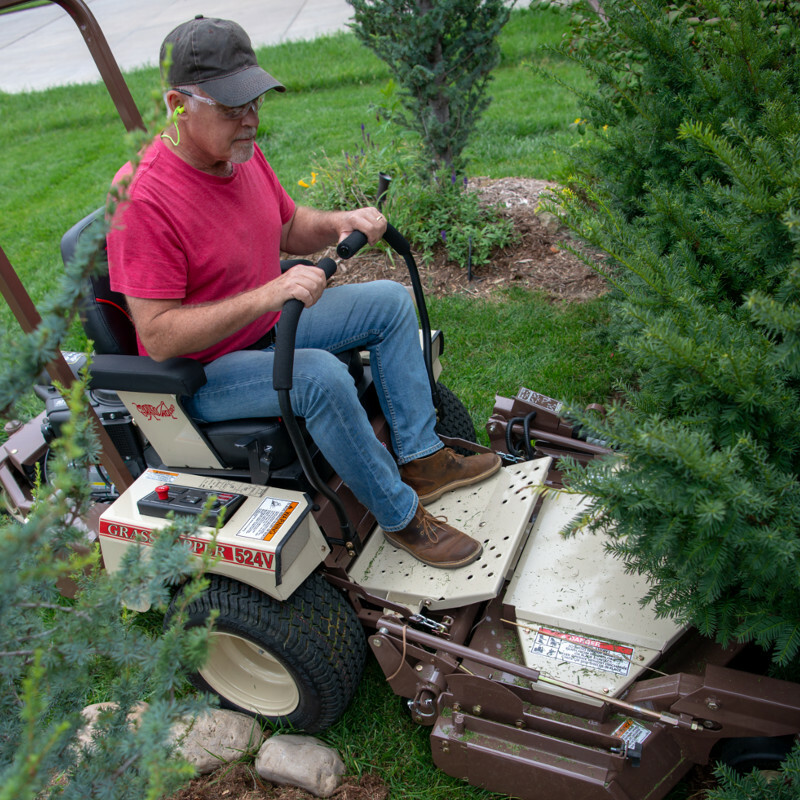 PowerFold® rotates the deck nearly 90 degrees to provide easy access to the underside of the deck for simplified maintenance and mulching package installation, plus space-saving portability and storage. The feature also adjusts cutting height between 2.0 and 4.5 inches and controls deck lift functions using a single switch. Commercial Use: 2-year or 800-hour (whichever comes first),; limited warranty covering parts and labor. 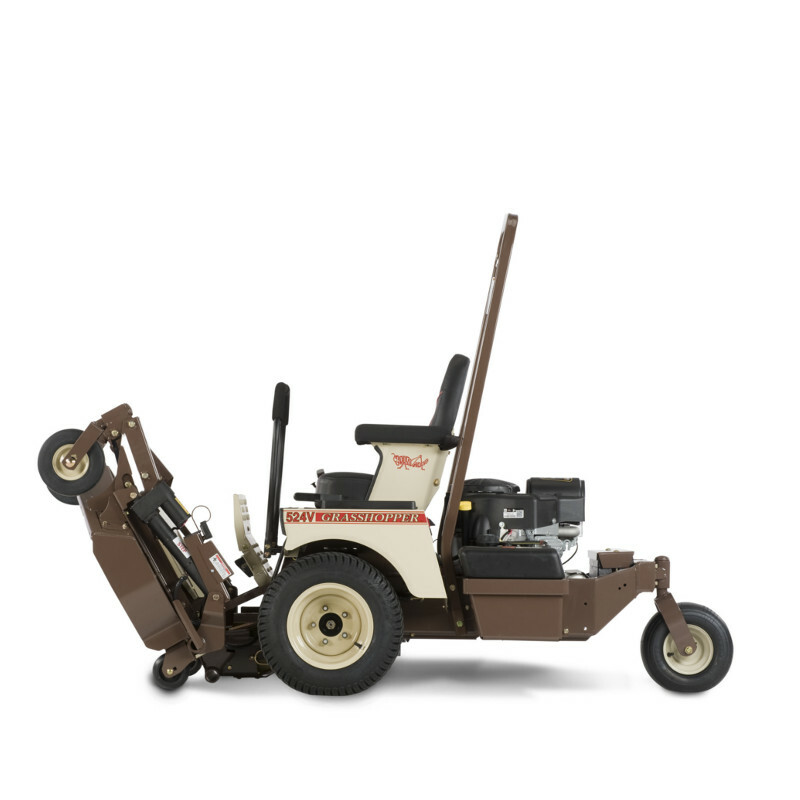 Residential Use: 4-year or 800-hour (whichever comes first); limited warranty: first two years covering parts and labor, second two years covering parts only. Available for all MidMount models, optional QuikAjust Tilt™ steering levers (except 124V-41) with "no tools" adjustment provide a 9-inch range for maximum comfort and fit while maintaining natural arm and wrist positions.. Wide stance single-fork tail wheels. An Adjustable Cup Holder locks into multiple positions to accommodate a wide range of drink sizes. 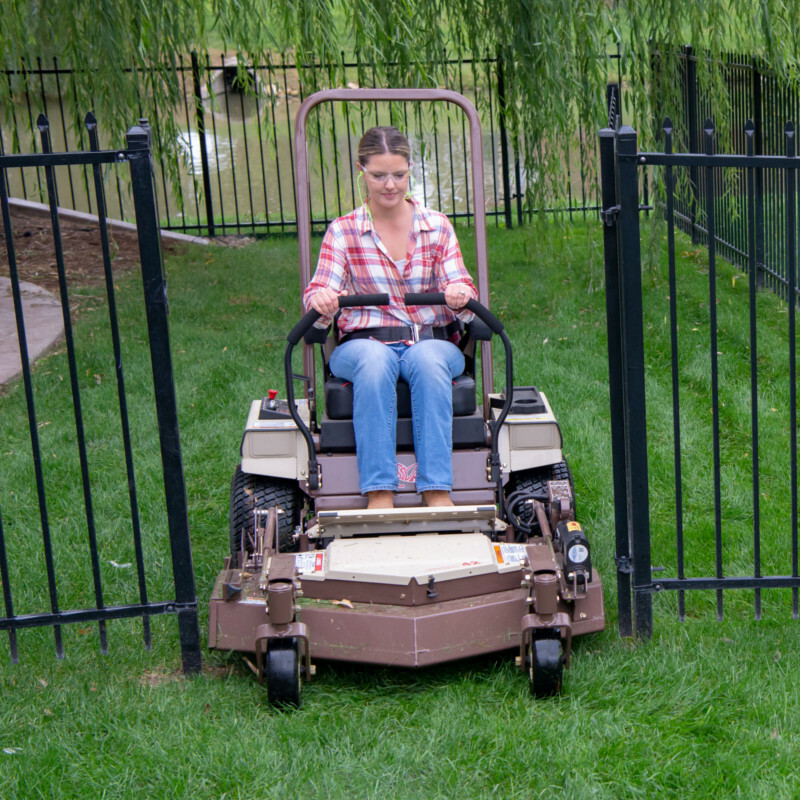 Deck Construction Geometrically engineered design with 7-gauge skirts withstands the brunt of commercial mowing. (3) Sentry™ spindles and a triple-strength upper deck over 0.50-in. thick in stress zones. Formed double thickness hardened steel truss spindle plane is 0.210 in. - equal to 5-gauge (5.31 mm). Anvil-edge design with reinforcement on front edge of deck. Deck Spindles Sentry™ Spindle System, 2.5 cm (approx. 1 in.) O.D. shaft. Spindle head designed to eliminate fiber wrap. Double bearings, non-greasable. Spindle cones shield housing and lower bearings from fiber wrap and dirt ingestion. Spindle Housing 8 in. (20.3 cm)-diameter machined aluminum housing with 6-bolt pattern. Operator Seat Ultimate Suspension Ride (USR) deep-cushioned, high-back, foam-padded, scuff-resistant CoolTemp Cordura®-covered with padded lumbar support and armrests. Console-mounted Instruments Low engine oil pressure and parking brake indicator lights, digital hour meter, ignition and push/pull PTO switches. Choke integrated with throttle lever. Transmission Type Design-matched hydrostatic system with integral cooling fans. Fully hydraulic, integrated Parker HTE Series transmission with variable displacement piston-type pumps and high-torque wheel motors for each drive wheel. Transmission Filtration Internal field-serviceable filter / No break-in oil change required; best-in-class service intervals with CoolTemp Hydro-Max™ fluid. Speeds 0 - 8.0 mph (0 - 12.9 kph) forward 0-5.5 mph (0-8.9 kph) reverse. Steering One- or two-hand operation with adjustable HydraSmooth™ dual levers that automatically return to neutral from either forward or reverse position. Colbert Lawnmower Shop Inc is your authorized Grasshopper dealer selling and servicing the complete line of Grasshopper MidMount™ and FrontMount™ mowers for turf care professionals, business and government entities, and homeowners.